If you love art then bring home this Howard Miller Quinten Mechanical Grandfather Clock. The clock features a hand-rubbed, satin luster Espresso finish on cherry hardwoods and veneers. A polished chrome door frame is prominently featured. The highly reflective shine and luster of the stainless steel case is the result of extensive polishing operations. Natural blemishes are normal. Polished chrome finished wrap-around base is included for two different looks. A flat top design features simple but elegant lines. Golden and stately the Howard Miller Nicolette Mechanical Grandfather Clock is the ideal household item for enhancing the elegance of its surroundings. The grandfather clock?s key distinguishing features which make it so unique include its intricately designed hardwood frame in a Gold Oak finish decorated with reeded columns, a bonnet pediment and a shell and vine overlay. They also include its face which features a lunar dial, a silver chapter ring with Arabic numerals as well as its matching weights and pendulum. Few clocks are capable of suffusing their surroundings with the very essence of Victorian luxury and glamour. And that is what makes the Howard Miller Robinson Mechanical Grandfather Clock so special. Brought to you in a gleaming hardwood frame with a cherry bordeaux finish, its decorative detail sets it apart from the rest. In addition to its ornate face, it also features gleaming brass weights as well as a lyre shaped pendulum. This ornate clock has also been fitted with adjustable levelers for uneven surfaces. 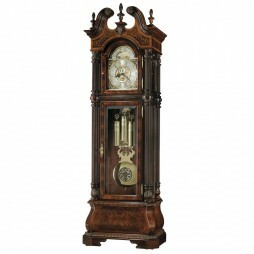 Check out the awesome Howard Miller Avalon Grandfather Clock from Clockshops. This modern, flat top features simple but elegant lines while the platform base elevates the clock off the floor. Espresso finish on select hardwoods and veneers. A polished chrome finished bezel surrounds the gloss white dial, which features black hour markers, minute track and hands. Polished chrome-finished decorative weight shells and chrome-finished extra long pendulum adds to the linear appeal of this clock. The finest thing about wall clocks is that they add to the decor and also keep you on time. This Howard Miller Cameron II Mechanical Floor Clock is a hand-rubbed, satin luster Cherry Bordeaux finish on cherry. The contemporary flat top design features simple but elegant lines. An easy to read gloss white dial features raised black hour markers with a black minute track and hands. The interior of the case is illuminated by touching the upper right door hinge. If your room setting is all about artistic furniture and decorations then make sure that you get the Howard Miller Cameron Mechanical Floor Clock. The contemporary flat top design features simple but elegant lines. An easy to read gloss white dial features raised black hour markers with a black minute track and hands. The interior of the case is illuminated with an energy efficient LED lamp which is dimmable to three settings by touching the upper right door hinge. This Howard Miller Kipling Mechanical Floor Clock comes in a Tobacco finish and is heavily distressed with deep dents, gouges, and chisel markings for an aged appearance. 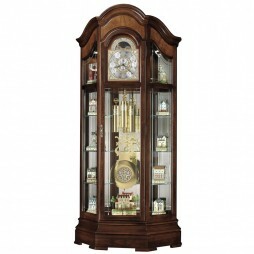 The clock case features a multi-tiered flat top and base and distinctive turned columns that frame the door. The aged dial features an open center which offers a view of the inner workings of the time mechanism, a Harvest brass bezel, raised aged dark brass Roman numerals, and aged dark brass hands. If you have a contemporary styled home, then this Howard Miller Jasper Mechanical Floor Clock from Clockshops will certainly be the perfect investment for you. 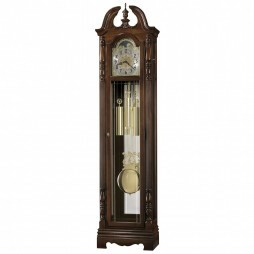 Designed beautifully, this grandfather clock showcases a simple, yet elegant design. The dial features a polished brass finished bezel with an elaborate center disk and includes a silver chapter ring with applied brass Roman numerals and black serpentine hands. Going beyond the conventional themes and designs, this Howard Miller Browman Mechanical Floor Clock will surely add an artistic touch to your interiors. It is a special 87th Anniversary Edition grandfather clock for 2013. Golden Oak finish on select hardwoods and veneers. The brass finished dial offers a circular brushed silver chapter ring with applied brass Arabic numerals, and an astrological blue moon phase. 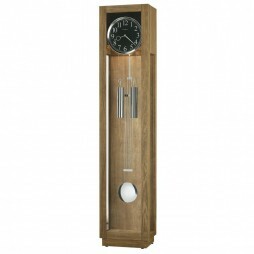 Choose the finest floor clocks this time from the makers of the best products. The high point of this amazing clock is that you can simply use it in the office or at home and it will just blend in with the rest of the furniture. It is a special 87th Anniversary Edition model for 2013. Cherry Bordeaux finish on select hardwoods and veneers. The polished brass finished dial offers detailed corner spandrels and center disc, a circular brushed silver chapter ring with applied brass Arabic numerals, and an astrological blue moon phase with a pierced star pattern. 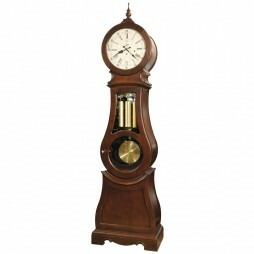 This stylish Howard Miller Kinsley Mechanical Floor Clock is a must have for every home owner. Golden Oak finish on select hardwoods and veneers. – Bonnet pediment features book-matched, olive ash burl overlays framed with decorative carved ornaments. The polished brass-finished dial features a decorative open center which offers a view of the inner workings of the movement, decorative corner ornaments, a moon arch with an astrological blue moon phase, and a silver chapter ring with applied brass Arabic numerals. The polished brass-finished pendulum features a decorative center disk which complements the dial and weight shells. Add an artistic feel to your modern interiors with this Howard Miller Beckett Mechanical Floor Clock. It is a larger 86th Anniversary Edition with special design detail on a handsome cherry case. The solid wood pediment arches upward with a beautiful keystone with a “Prince of Wales” inlay between two book-matched crotch figured mahogany overlays. A special Windsor Cherry real lacquer finish on select solid hardwoods and veneers. Clocks in modern homes are not considered as just time pieces. They are additional decor that plays a major part in defining the style quotient of any room. This wonderful Howard Miller Winterhalder II Mechanical Floor Clock from Clockshops will be a classy addition to any room. The polished brass-finished dial features an open center which offers a view of the inner workings of the movement, elaborate center and corner ornaments, a moon arch with an astrological blue moon phase with a pierced star pattern, and a silver chapter ring with applied brass Arabic numerals. 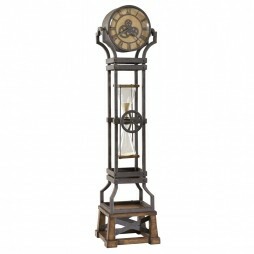 This unique Howard Miller Coolidge Mechanical Floor Clock will definitely accentuate the beauty of your home. A graceful stepped, swan neck pediment features a book-matched olive ash burl overlay panel with a turned finial, rosettes, and a decorative shell ornament. Hinged top side doors and large reeded columns with turned column caps frame the doors. Glass mirrored back panel and locking lower front door. Wall clocks are no more just time keeping gadgets but are also decor products that have the power to add a lot of charm to any room. This Howard Miller Nicea Mechanical Grandfather Clock offers a bonnet pediment featuring a dramatic carved shell framed by stepped swan neck pediment moldings. Base includes a decorative cutout. Polished brass dial offers ornate corner spandrels, center disk, silver chapter ring with black Arabic numerals, and a stationary blue moon phase. This Howard Miller Warren Mechanical Grandfather Clock is a stunning piece of art work that will add beauty and grace to your walls. Swan-neck pediment features a turned urn finial and a decorative shell overlay. Cherry Bordeaux finish and a mirrored back. Base includes a decorative cutout. Polished brass dial features elaborate corner spandrels, center disk, silver chapter rings with satin black Arabic numerals, and midnight blue astrologically correct moon phase that moves with the lunar phase. This Howard Miller Scarborough Mechanical Grandfather Clock is the perfect synchronization of art & technology. Special 82nd Anniversary Edition floor clock features a distinct bonnet pediment with book-matched olive ash burl overlays and a decorative carved applique. Brushed satin brass finished dial features cast center and corner ornaments, and a moon arch with an astrological blue moon phase. Pendulum with cast center disk and banded weight shells feature brushed satin brass finish to complement the dial. It is the artistic design, intricate detailing and chic finishing that lends it a more modern, sophisticated touch. 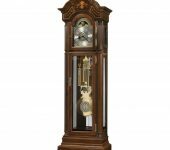 Proudly flaunt your flashy style with this special 82nd Anniversary Limited Edition Howard Miller Edinburg Mechanical Grandfather Clock, which features a swan neck pediment with book-matched olive ash burl overlays and three turned urn finials. Brushed satin brass finished dial and a functional moon phase. Multi-tiered carved bombe base. Locking door and Glass mirrored back. Add a surreal and unique effect to your interiors by choosing this wall clock. Brought to you by Safal, this particular accessory has been designed in minimalistic brown tone, which can be used for harmonizing your modern interiors and furnishings with each other. This classic floor clock features a graceful, bookmatched olive ash burl swan neck pediment with a turned urn finial and decorative shell overlay. The brushed satin brass dial features cast corner and center ornaments with a silver chapter ring and satin black Arabic numerals. Add a touch of Gothic inspired mystique and glamour to your home with the intricately designed Howard Miller Duvall Mechanical Grandfather Clock. 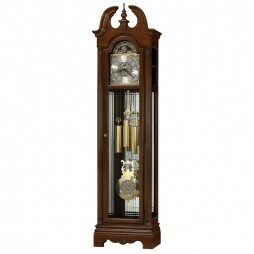 Thanks to the charm of its dark wooden case in a Windsor Cherry finish perfectly balanced by its ornate dial, brass weights and pendulum, this grandfather clock will enhance the beauty of your home. This household item also comes with a free brass heirloom nameplate which will be engraved with your name and special date and a free heirloom record document with a brass-finished capsule. 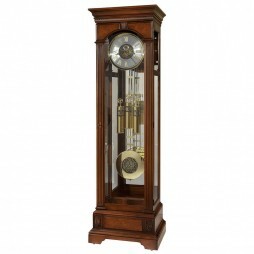 Bestow an ambience of stately grandeur on your living room or hallway with the Howard Miller Eisenhower Mechanical Grandfather Clock. The smooth brown of its impressively ornate hardwood frame in a Windsor Cherry finish is perfectly complemented by its intricate dial, matching brass weights and pendulum. This captivating time piece also comes with a Howard Miller Heirloom capsule containing a certificate detailing the clock?s history as well as a brass Heirloom nameplate engraved with your name and a special date for a personal touch. 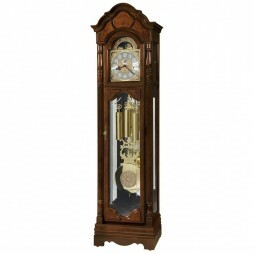 With its ornate case, a dial designed in intricate detail and brass fittings, the Howard Miller Lindsey Mechanical Grandfather Clock will enliven your hallway or living room. This delightful time piece also comes with a Howard Miller Heirloom capsule containing a certificate detailing the clock ‘s history. 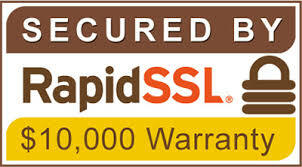 What?s more, a brass Heirloom nameplate will also be engraved with your name and a special date for a personal touch. Every home deserves an elegant, luxurious time piece that will make all its other special qualities stand out. And you can be certain that the Howard Miller The J. H. Miller II Mechanical Grandfather Clock will have that effect in any room in which it is placed. The clock?s hardwood frame is covered in a Windsor Cherry finish and features swan neck pediments and three turned finials. It has also been decorated with upper and lower fluted columns and doors as well as beveled glass at its front and sides. The clock?s face consists of a lunar dial, corner spandrels, with a central decoration. It also features brass Roman numerals against a silver chapter ring and serpentine hands. A brass-finished lyre pendulum and polished brass finished weight shells can also be seen through the lower door?s glass panel. 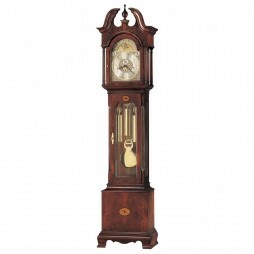 Intricate, detailed and striking, the Howard Miller The J. H. Miller Mechanical Grandfather Clock is just what you need to evoke the rich, elaborate detail of mid eighteenth century Gothic style in your home. Its hardwood frame is covered in a Windsor Cherry finish. In addition to featuring swan neck pediments, three turned finials, the frame has also been decorated with fluted upper and lower columns carved with acanthus motifs. It has also been fitted with lower and upper doors and beveled glass at the front and sides, while its bombe style base has been decorated with moldings. The clock?s face consists of a lunar dial, corner spandrels, with a central decoration. It has also been fitted with brass Roman numerals against a silver chapter ring and serpentine hands. A brass-finished lyre pendulum and polished brass finished weight shells can also be seen through the glass panel of its lower door. Invite a special select ambience into your surroundings with this clock which is suitable for almost any setting thanks to its versatile design. Combining modern technology with ancient time measuring techniques, this clock with a face encased in an aged iron frame features an hourglass at the center of its case which is also made of aged iron. Capable of measuring approximately an hour, the hourglass can also be adjusted manually. The wooden base of the clock has also been covered with a weathered wood finish to give it an aged look which complements the clock?s metal parts. This striking time piece also comes with a quartz, battery-operated, triple-chime Harmonic movement, volume control and an automatic night time chime shut-off option. With its delicate faade in light brown, accentuated by its brass detail, the Howard Miller Bronson Mechanical Grandfather Clock will bring a burnished bronze ambience into your home reminiscent of autumn?s golden brown hues. Its hardwood case has been covered with a Golden Oak finish and decorated with an arched pediment and olive ash burl overlay. The clock also features an ornate face with corner spandrels, a lunar dial as well as serpentine hands. The clock?s face also comes with a silver chapter ring and raised Arabic numerals. 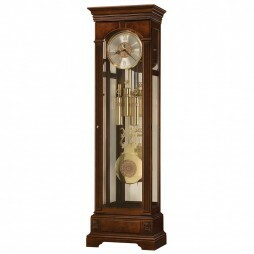 Matching brass weight shells and a lyre shaped pendulum further enhance the antique appeal of this detailed time piece. The grandfather clock also comes with a Kieninger movement which plays a selection of chimes as well as an automatic night time shut off option. Add an industrial inspired elegance to your dcor with the Howard Miller Chaplin IV Floor Clock. Featuring a hardwood tripod frame which has been slightly distressed and covered with an aged auburn finish, the clock also comes with a white face with nickel finished hands and hour markers set in a metal frame. 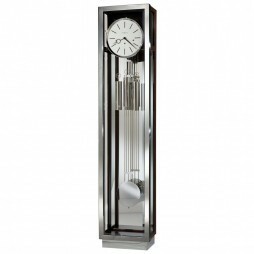 This time piece has been fitted with a chrome pendulum below the frame and also features a Quartz, accurate Triple-chime Harmonic movement which plays Westminster, Ave Maria and Bim-Bam chimes. Antique styled and elaborate, the Howard Miller Langston Mechanical Floor Clock is just what you need for a hint of American colonial style glamour. Its exquisite hardwood frame in a Windsor cherry finish has been decorated with a split pediment and finial. It also features glass panels through which the interior of the clock can be seen as well as adjustable levelers for uneven surfaces. The clock?s face has been detailed with corner spandrels and features a silver chapter ring with applied brass Arabic numerals. It has also been decorated with a lunar dial. A set of matching brass weights as well as a lyre inspired pendulum further enhance the clock?s appeal. A Keininger movement which plays a choice of chimes as well as a night time shut off option have also been provided. With its slender, polished case, internal illumination and pale golden faade, the Howard Miller Benjamin Mechanical Floor Clock is the ideal household ornament for providing a subtle hint of vintage appeal to your hallway or living room. Its elaborately decorated face which can be found below an astrological blue moon phase comes with a silver chapter ring, Arabic numerals and serpentine hands. Its polished weights and pendulum are reflected in the case?s mirrored back wall. The clock?s additional features include its beveled glass, adjustable levelers to balance it on uneven surfaces and a cable-driven, Westminster chime Kieninger movement. Grand, majestic, imposing. 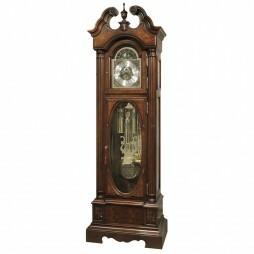 With these three qualities and more, the Howard Miller Polk Mechanical Floor Clock is the very image of Victorian splendor and will impart a glamour reminiscent of the era to your home filling it with its special, elusive quality. Its highly decorated hardwood case features marquets on its front door as well as a swan pediment and finial. It has also been designed with canted columns, beveled glass and an LED light to illuminate its interior. Its ornate silver dial incorporates an astrological moon phase, serpentine hands and Arabic numerals. The lower part of the clock contains brass weights with decorative bands and a pendulum. The clock has also been fitted with a cable-driven, dual chime / strike movement which plays America the Beautiful or Westminster chimes and an automatic night time chime shut-off option. Clocks which are ornately designed and also make it possible for you to decorate them even further are extra special. Just like the Howard Miller Majestic II Mechanical Floor Clock which is one such time piece. Its large smooth hardwood frame in a Windsor Cherry finish carved with an arched pediment provides this mechanical grandfather clock with a distinct sophistication. This frame has also been fitted with six glass shelves on which your ornaments can be placed further enhancing the clock?s decorative appeal. This large sized clock also comes with an astrological, blue moon phase placed directly above a special cast dial decorated with elaborate corner spandrels and a disk at its center. Gleaming brass weights and a pendulum with a similar special cast design to the dial?s can also be seen through its crystal cut glass panes. This clock has also been provided with adjustable levelers at each corner of its base, to provide stability on even and uneven surfaces. With its detailed design and graceful style, the Howard Miller Harland Mechanical Grandfather Clock is the ideal choice for anyone interested in adding a captivating antique ambience to their home. Its face which has been placed directly below a lunar dial has been decorated with corner spandrels and also comes with a silver chapter ring featuring Arabic numerals. 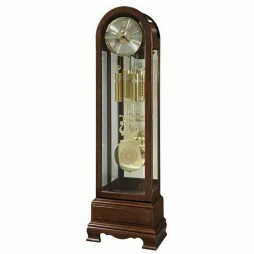 The clock also comes with brass finished weights and a pendulum as well as an ornate hardwood case in a Cherry Bordeaux finish. This elegant wooden frame has also been decorated with a swan-neck pediment and a turned finial and fitted with glass panels through which its contents can be seen. 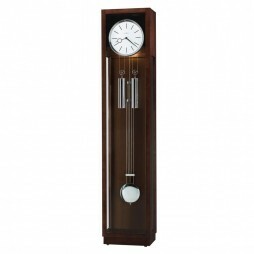 An exquisitely designed time piece, the Howard Miller Jonathan Mechanical Floor Clock will bestow its own unique classic appeal on any room it is placed in. Featuring a case created from hardwood with a Windsor Cherry finish, it has also been designed with a swan neck pediment and a turned finial. Its face which has been decorated with ornate corner spandrels has a stationary blue moon phase positioned directly above it while polished brass-finished weights and a pendulum can be seen behind glass panels. The clock also comes with a chain-driven, Westminster chime Kieninger movement as well as a chime silence option. 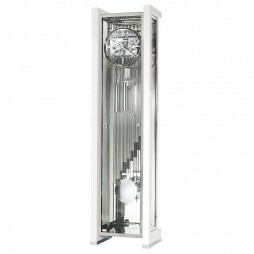 Enliven your living room with the captivating silvery delight of the Howard Miller Blayne Quartz Grandfather Clock. With the simple, smooth lines of its hardwood frame covered in a shiny silver finish, this modern version of one the most popular clocks will make your home appear timeless and enthralling. This captivating household item also features a white dial with gleaming chrome hour markers and hands surrounded by a bezel in a chrome finish as well as weight shells and a grid pendulum in the same silvery finish. It also comes with a quartz, triple chime Harmonic movement that plays Westminster or Ave Maria chimes, volume control and an automatic night time chime shut-off option. With its tones of reddish brown, brass and silver, the Howard Miller Taylor Mechanical Floor Clock is just what you need for an aura of antique elegance in your home. This traditionally designed clock?s key features include a hardwood case covered with a Windsor Cherry finish and a swan neck pediment. It has also been fitted with a dial inscribed with Arabic numerals as well as a moon phase with Presidential Collection hemispheres. The clock also comes with a cable-driven, triple-chime Kieninger movement which plays Westminster, St. Michael, or Whittington chimes and an automatic night time chime shut-off option. There are a few combinations which always look amazing with anything – like the magical trio of dark brown, chrome and white. And when they come in a fusion of traditional and modern influences, you can be certain that their effect will be especially magical. Like the Ridgeway Rutland Mechanical Floor Clock inspired by the traditional grandfather clock with a few pleasant surprises of its own. These include the elegant simplicity of its dark brown case created from select cherry hardwood, covered with a Manhattan finish and fitted with beveled glass panels which ensure that the clock?s additional features stand out. They also include the white dial with Arabic numerals and tapered hands surrounded by a chrome finished bezel below which matching weights and a pendulum equally finished in chrome are suspended. This clock also comes with a Westminster chime Kieninger movement and an automatic nighttime chime shut-off option. Enhance the allure of your hallway, living room or lounge with this spectacular take on the traditional grandfather clock. The minimalist elegance of its frame ensures its key features stand out while its matte brown Driftwood finish highlights the clock?s silvery chrome and black accents. Surrounded by a polished chrome finished bezel, its black dial also features silver Arabic numerals and hands, providing a contrast which enables them to particularly stand out. Beneath the dial are suspended chrome finished matching weights on either side of the pendulum in the same alluring finish. This eclectic time piece also comes with a quartz, battery-operated, triple chime Harmonic movement which plays Westminster, Bim Bam and Ave Maria chimes. There are some household items which are simply irresistible particularly in terms, of style, functionality and excellent workmanship. 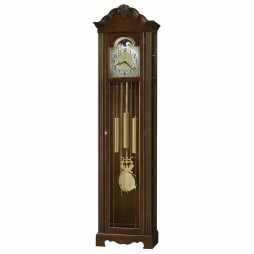 And you can be certain that the Ridgeway Dover Mechanical Floor Clock brought to you in an enchanting design which stands out is one of them. Its case which is molded to the shape of its round face, extending downwards to a solid multi-tier base and bun feet, is covered with a Bellair Cherry finish and features an olive ash burl overlay. It has also been fitted with glass panels at its front, back and sides through which its contents can be seen. These include its white face set in a gleaming brass bezel, with Roman numerals, serpentine hands and a central decoration. The clock also comes with gleaming brass weights and a large pendulum which features a decoration which matches the dial?s. This lovely household item has also been fitted with a cable-driven, Westminster chime Kieninger movement and an automatic night time chime shut-off option. Give your home the perfect gift that will make it glow with the sedate period elegance evocative of an English countryside manor. Thanks to the stately Howard Miller Wilford Mechanical Grandfather Clock you will be able to transform your room enhancing its ambiance significantly. This 88th Anniversary Edition in a real Cherry Bordeaux finish has been designed with an arched top and a bonnet pediment with book-matched, ash burl overlays. The clock also comes with a lunar dial featuring a pierced star pattern and a brass clock face decorated with corner spandrels, a central disc and a circular brushed silver chapter ring. Its polished brass-finished pendulum with a central decoration and gleaming weight shells can also be seen through its front glass panel. This remarkable house hold item has also been fitted with a Westminster chime Kieninger movement and an automatic nighttime chime shut-off option. Make your surroundings stand out with this alternatively styled time piece reminiscent of a grandfather clock with a modern twist. Featuring a case covered with a Marquis Cherry finish, it has also been fitted with a convex glass on its upper and lower doors and styled with decorative carved accents, and a turned urn finial. This clock also comes with a face which has black spade hands and a separate track for counting seconds. 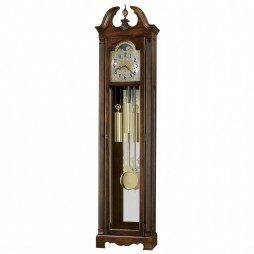 Its additional features include weight shells and a pendulum finished in brushed, antique brass as well as a Kieninger movement and an automatic night time chime shut-off option. 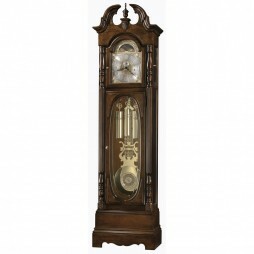 Use the beauty of this Alford Howard Miller Grandfather Clock to make your home a stylish place. The creative design with a lightly distressed Hampton Cherry finish will attract a lot of attention from the onlookers. The dial features an open center which offers a view of the inner workings of the movement, applied brass numerals and black serpentine hands. The front door features book-matched olive ash burl overlays. A book-matched olive ash burl overlay continues on the multi-tiered base. Beveled glass on the front door and an illuminated dial and case with a glass mirrored back. Cable-driven, Westminster chime Kieninger movement plays 1/4, 1/2, and 3/4 chimes accordingly with full chime and strike on the hour. 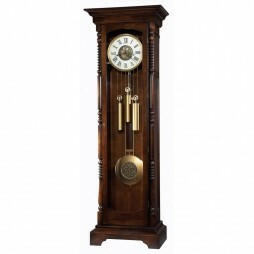 Designed and assembled in the United States, this clock is beautifully crafted to last multiple generations. A free Heirloom Record Certificate with brass-finished capsule is included; as well as a free brass heirloom nameplate, engraved with your name and special date. Allow the radiance of polished brass, silver and richly colored gleaming wood, to turn your home into a magical, enchanting place with the Ridgeway Mildenhall Mechanical Floor Clock. 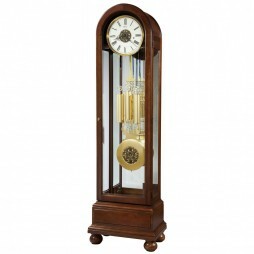 The distinguishing features of this exquisite clock include its brass and silver dial with golden Roman numerals and black serpentine hands, identical banded weights and lyre inspired pendulum which stand out against the subtle design of its case covered in a Bellaire finish and fitted with glass panels at its front, back and sides. This eclectic time piece also features a cable-driven, Westminster chime Kieninger movement and an automatic night time chime shut-off option. 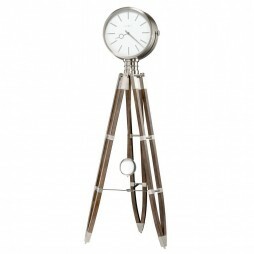 Featuring a classic design, this Howard Miller Chaplin Tripod Driftwood Floor Clock II 615-071 is a must-have in any modern home. Finished in Driftwood for a weathered and distressed appearance with polished chrome-finished metal accents. 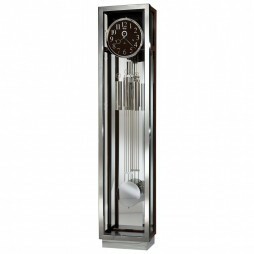 This floor clock features a large; stationary soft black dial featuring chrome finished Arabic numerals, minute and seconds track, and hands, and is surrounded by a wide, polished chrome-finished bezel. With volume control and automatic nighttime chime shut-off options; this clock represents the finest in Grandfather and Floor Clock quality and design! 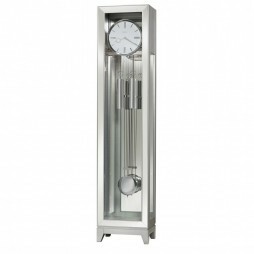 The Park Avenue II Limited Edition Floor Clock offers an exquisite hand rubbed, highly polished Gloss White finish accented by a polished steel chrome case and feet. Additional light through the tempered beveled glass sides highlight the interior that features a mirrored back and bottom and LED lighting. Kieninger cable-driven, triple melody, nine-tubular chime movement is highly polished, chrome plated and features 36 bushings (24 bronze and 12 jeweled) and plays choice of Westminster, St. Michael, or Whittington 1/4, 1/2, and 3/4 chimes accordingly with full chime and strike on the hour. This clock will be numbered with an engraved numbered plate. Absolutely gorgeous! Exquisite! Striking! One-of-a-kind! These are just a few adjectives to describe the Park Avenue Limited Edition Contemporary Floor Clock. This clock will be numbered with an engraved numbered plate. It features a beautiful polished Gloss Black Finish accented by a polished steel chrome case and feet. Designed with tempered, beveled glass on the sides to allow additional light to brighten the interior, this clock features a mirrored back and bottom and LED light strip. The Kieninger cable-driven, triple melody, nine-tubular chime movement is highly polished, chrome plated and features 36 bushings (24 bronze and 12 jeweled) and plays choice of Westminster, St. Michael, or Whittington 1/4, 1/2, and 3/4 chimes accordingly with full chime and strike on the hour. Uniquely inspired by retro Hollywood movie lights, the Chaplin Tripod Floor Clock offers legs finished in Black Coffee with polished chrome metal accents. The large white dial has black Roman numerals and hands, encircled by a wide, polished chrome bezel. Enjoy the quartz, triple-chime Harmonic movements that plays your choice of Westminster or Ave Maria chimes on the quarter hour, and Westminster or Bim-Bam chimes on the hour. Adjustable volume control and automatic nighttime chime shut-off are included. Everyone wants to decorate their home with art and decor that signifies their own personal style. And what better way to make a statement than setting up a tasteful accessory that shines purely on its own? Give your visitors something to gawk at by investing in a truly majestic grandfather clock. These treasured pieces are a treat for anyone interested in sophistication and intrigue behind their home decor. After all, these elegant floor clocks always come with an air of mystery to them, compelling those who come upon them to figure out the rich history behind their origin. Give your home a touch of tasteful, chic decor by browsing through ClockShops.com’s beautiful selection of grandfather clocks. Treat yourself to something you’ll delight in telling your friends and family about from the moment it crosses your threshold. Choose from anything we have to offer, from more traditional models to abstract, magically unique floor pieces. We have everything in stock you’d want to fill that empty space with an exceptional work of art. So whether you are looking for a signature Howard Miller grandfather clock or a contemporary Ridgeway floor clock, find yourself that perfect new accessory. Get ready to dramatize your foyer, accentuate your living room decor, or even create a more sophisticated office setup. Nothing screams beautiful clockmaking like the name Howard Miller. 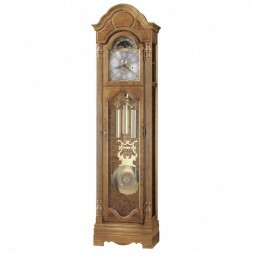 With years of expertise and flawless clockmaking under their belt, Howard Miller has amassed a large collection of grandfather clocks that will upgrade any home. And we have plenty of their finest pieces in stock, right here at ClockShops.com. Each of the grandfather clocks and other various floor clocks feature a German-made Kieninger movement, mechanisms that are designed to last for generations. 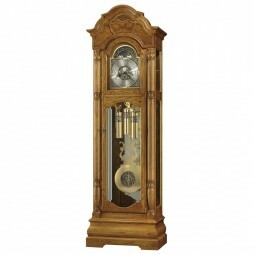 Start your search off the right way by checking out the Howard Miller Harding Mechanical Grandfather Clock. This stunning figure features a hand-rubbed, cherry Bordeaux finish; a mirrored back panel to create that extra element of shine; a brass-finished dial and astrological blue moon phase, and so much more. It also has an array of chiming melodies to fill your house with the familiar, heart-warming sound of bells. 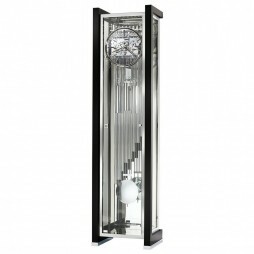 Or forego traditional for something truly unique and exquisite, like the Howard Miller Hourglass Mechanical Floor Clock. With a metal frame finished in aged iron, this floor clock will fit right into plenty of home decor styles, from basic to overtly modern. A makeshift hourglass in the center of the frame can be rotated, pulling off a truly magnificent sight. And the gears on the clock face give an edgier, mechanical vibe that denotes an antique feel you’ll be happy to add to your decor. If modern or contemporary is more your style, Expressions of Time has clocks that suit those needs as well. We offer a wide selection of modern designed grandfather and floor clocks, such as the Howard Miller Quinten series that offers similar styles but with different material colors and finishes. This small selection of high-shine clocks features sleek designs and metallic hues, easily ready to complement other new-age decor. 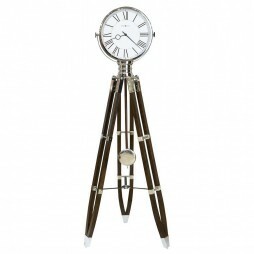 The Howard Miller Chaplin Tripod Floor Clock series with their tripod bases are simply spectacular as well. They make quite the statement, offering a floor model clock unlike anything you’ve ever seen. 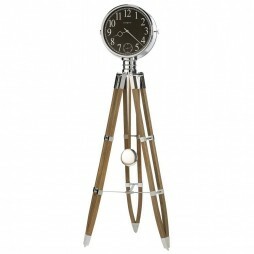 The oversized clock dials rest atop the tripod, giving you the high-quality function to go with the flashy designs. And they come in a variety of monochromatic colors, which can quickly adapt into any fashionable, trendy living room or office set. Ridgeway clocks have a knack for creating that perfect blend of high-quality craftsmanship and sublime simplicity that fits superbly into any home decor. For something timeless and sensational, look into the Ridgeway Harper Traditional Grandfather Clock, or the Morgantown or Zeeland models. These traditional designs all come with beautifully curved pediments, lovely finials and shiny veneers that give these classic frames their high-fashion that never goes out of style. With different hardwoods to choose from like cherry and walnut, you can find any Ridgeway model you need to slip right into your current decor, meeting that perfect shade of color without a hitch. And the oversized pendulums and disk accessories call out to anyone walking by, simply due to their sheer elegance and refinement. 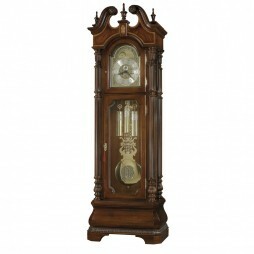 Your home deserves grandfather clocks and floor clocks that last a lifetime. Invest in your perfect model from Expressions of Time today, and choose from a vast assortment of reputable brands we’ve collected just for you. From traditional to modern, simple to over-the-top glam, you won’t be wanting for anything when you take a look through our enormous stock of essential grandfather clocks and floor clocks for your living space. We offer the most popular, dependable brands and styles on the market, and we proudly stand behind our affordable rates. Make a statement that calls out to anyone who walks through your door. Invite your guests to discuss the story behind your latest find, the majestic Howard Miller grandfather clock you have on display in your foyer. Or fill up that empty corner in your living room with a timeless creation that can be handed down through generations of your family, becoming the new keepsake everyone will fight over. Let Expressions of Time be your guide to supreme quality and excellence, furnishing your home with yet another tasteful piece that exudes grace and chic, top-notch design. And don’t get caught up in the extra details. With free shipping on your home delivery, you’ll have no worries about how to get your shiny new purchase to your home, safely and affordably. We here at ClockShops.com only want to provide you with the best in customer service and quality items. Our top priority is to bring magic to your door, so rely on us to get the job done right.